Martin Comerford played on the Kilkenny senior hurling team from 2002 to 2010, and played a crucial goal in Kilkenny’s victory in the 2009 All-Ireland hurling final. Martin Comerford was born on 9 November 1978 in Kilkenny. His older brother, Andy Comerford, has also played on the Kilkenny Hurling team, and captained the winning side in the 2002 All-Ireland hurling final (see Comerford Profiles 25: Andy Comerford, Kilkenny hurler). A player with the O’Loughlin Gaels Club in Co Kilkenny, Comerford joined his county’s senior hurling panel in 2001, and was the team captain in 2004. As a player at all levels with Kilkenny, Martin Comerford has won many honours in the game, including four All-Ireland Senior Hurling medals, eight Leinster Senior Hurling medals, four National Hurling League medals, one All-Ireland Under-21 medal and three All Star awards. 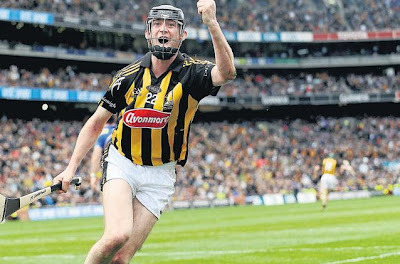 Although he was not included in Brian Cody’s choice of the first 15 for the 2009 All-Ireland final, Martin Comerford came on as a substitute in the final against Tipperary, and quickly scored the decisive goal that turned the game in Kilkenny’s favour. He retired from Kilkenny senior hurling in 2010. He is known affectionately among the proud Kilkenny supporters as “Gorta” – a name that recalls how skinny he was as a child.